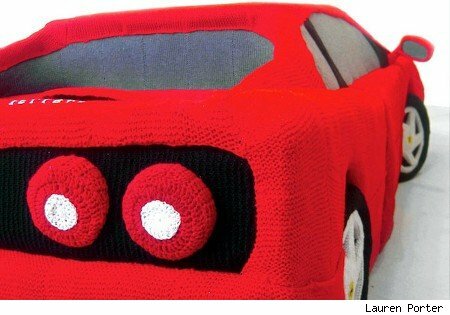 Art student Lauren Porter created a knitted Ferrari F355 as a project during her art course, intending to contrast "the high design of the sports car with the traditional home craft of knitting". And also to get lots of media coverage. We've not driven the knitted Ferrari, but we're told the handling is a bit woolly and the ride a touch soft. That's just what happens when a car is made out of 12 miles of yarn. Lauren's next artistic project is a series of quilted birds. Click below to watch the videos.